Sargent Mountain is a lovely hike in Acadia National Park, and it is the go-to spot for finding snowy owls. The hike starts on the carriage roads, then turns into a narrow trail, followed by the exposed summit above treeline. People who do regular hiking (up mountains) would consider this easy / moderate. However, if you don’t have a lot of experience hiking up mountains (particularly in the winter), you will find this fairly strenuous. Snowy owls arrive in Acadia around November / December. They travel from their Arctic breeding grounds in search of food that is too scarce further north. Acadia is a regular destination for these owls, probably because it reminds them of the tundra that they came from. They hunt during the day (it’s always day in the Arctic summer), usually from a perch on the ground but also from trees and fence posts. Remember, owls are wild animals, and we want to keep them that way. Keep your distance, and try to avoid disturbing them too much. 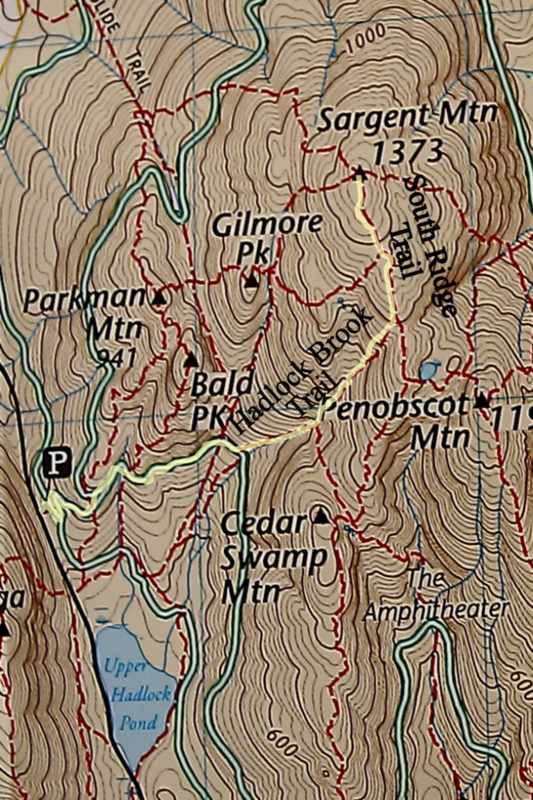 I use the South Ridge Trail (via the Hadlock Brook Trail) to get to Sargent Mountain’s summit. This is considered the best trail for seeing the owls. 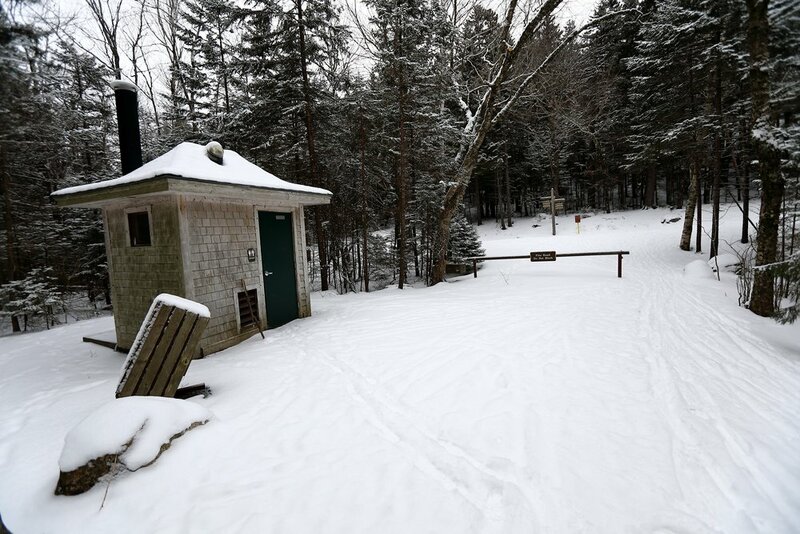 Parking is located at the Parkman Mountain trailhead. Parking for Sargent Mountain is up the hill and on the left (coming from the north). You can see a car pulling out of the parking lot onto the road in the photo above. Parking lot for Sargent Mountain. You can see the bathroom in the background. There is a bathroom right near the parking lot. It had toilet paper in it, but I would bring some with you just in case it doesn’t! The loop road is closed in the winter, so you cannot access any trailheads by car from that area. Below, I have outlined on the map the route I take up (in yellow). I go down the same way because I feel bad “chasing” the owls further and further up the mountain, but it is possible to make a loop of your hike if you’d like. I’d recommend getting this map which includes all the trails of Acadia. I use it all the time! It is difficult knowing what gear you’ll need for your hike. I live in Bangor, and even though I’m only an hour away, the coast has completely different weather than we do. The easiest thing for me is to pack EVERYTHING (snowshoes, cross-country skis, winter hiking boots, crampons, and nano spikes). When I get to the parking lot, I look at the carriage roads and decide from there what I am going to use. You can use cross-country skis on the carriage roads (it is a gradual uphill on the way up, but then a gradual downhill on the way back! ), but if the snow is really deep, you may be better off with snowshoes. Other times I’ve been fine with just winter hiking boots, although nano spikes are a nice addition to give you a little extra grip on the snow. Personally, I use nano spikes the most and think they are the best! I will be making a separate gear guide for this hike if you’d like more suggestions (including photography material). This is a photo from a day I hiked Sargent Mountain while I was dog sitting. We just had a snow storm, and the snow was very deep. This day was a snowshoe day! Word of advice: don’t bring dogs on this hike for two reasons: 1) They may scare the owls. 2) They may not make it to the top. In our case, my dog was physically unable to get up the steep exposed rock that had a sheet of slick ice underneath. She jump and tried will all her might, but she just kept sliding down. As you continue up the carriage road, you will pass over one bridge, and there is another bridge shortly after. Just before this second bridge is a trail to the left (Hadlock Brook Trail). Turn left on this, and make your way up the mountain. We usually stop and look at the waterfall from the bridge before we begin our ascent. You will cross over a few sections of river (likely frozen), and eventually you will make it above treeline. The ground will start to turn into sheer rock, and this is often extremely icy and slippery. The last time I hiked this, I couldn’t find my nano spikes, so I wore boots and kept crampons in my backpack. I was too lazy to put my crampons on, and I was able to make it up fine, but I had to walk in the woods to the right of the slick rock, using the trees to help me stay upright if I slid. I did fall on the ice several times, hitting my head hard on one occasion, so I would recommend nano spikes at the very least. There have been times where nano spikes weren’t enough and I had to break out the crampons. Once you get above treeline, I would recommend taking off your nano spikes or crampons because they can be noisy. Make sure to bundle up because you will now be exposed to the wind and cold, and you will be stopping a lot to watch the owls. The owls usually sit on a high area of ground, and they can be tricky to spot at times. They don’t scare easily, but they will fly away if you get too close. If they fly away, you can see where they go most of the time, and you can slowly follow them up the mountain. After 2-3 times of flying away, I usually leave them alone. Can you find the owl in the photo below? When we tried getting closer to this owl, he flew away. As we moved onwards up the mountain, another owl flew to the same spot where this owl was. He flew away as well, and this is where we found him next. Can you spot him below? The owl above is in the middle of the photo on top of the pile of snow. Below are some close-up photos that show how carefree the owls are while we watch. They kept looking around in all directions, and even scratched/cleaned themselves on occasion! Dale was quite the sport as I took photos. It is very cold when you are exposed to the elements and not moving, so I can’t stress the importance of bringing warm gear with you! After enjoying the owls, we went down the same way we came up. It is possible to make a loop (which I usually prefer), but I didn’t want to bother the owls any more. Making our way home on the carriage roads. What a wonderful day!